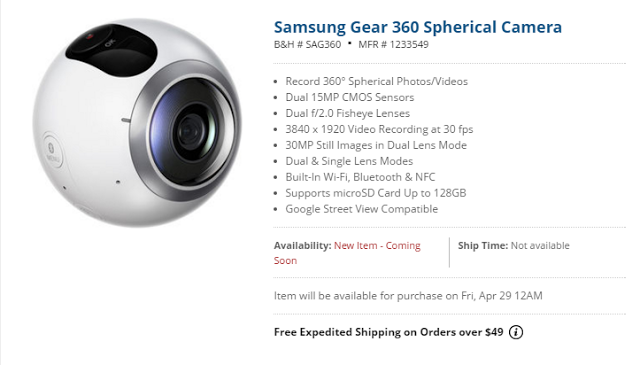 We finally have a specific date for the Samsung Gear 360’s availability: according to B&H, they will start taking orders on April 29 at 12am. The time zone is not known but B&H is based in New York, so if it’s Eastern Time, technically the camera becomes available April 28 at 9pm on the West Coast. B&H removed the price from their page, and the price still remains unconfirmed (the last price they showed was $349.99). Personally, I think it’s a pretty good camera, but I use an iPhone, and I have doubts about whether Samsung will allow it to connect to iPhones. To see related posts on the Samsung Gear 360 and other topics, click on the label/tags below (below the sharing icons), or check the tag cloud on the right side of the page.